About 10 days after we arrived back home in Barcelona from our trip to Amsterdam (I promise, a trip report is coming soon! ), we left for yet another trip to Budapest, Hungary! Connecting with this sweet couple once again happened because of the amazing blessings of social media! I won’t go into the whole back story, because it’s rather involved, but I will definitely recommend to anyone traveling to take advantage of any connections you already have. There are some AMAZING Facebook groups that are total gold minds for traveling families, and the local Budapest group was phenomenal! Not only was everyone SUPER helpful in giving me travel tips for our family and kids, but they also helped me find a babysitter, explained confusing public transport, and when I said I was hoping to photograph an anniversary or styled wedding shoot while visiting, the PERFECT person replied! Piroska jumped at the opportunity for good reason: when she and Miki married 10 years ago, they were young and didn’t have much of a budget for photography. She recounted how they really didn’t have many good wedding portraits, which is so sad! 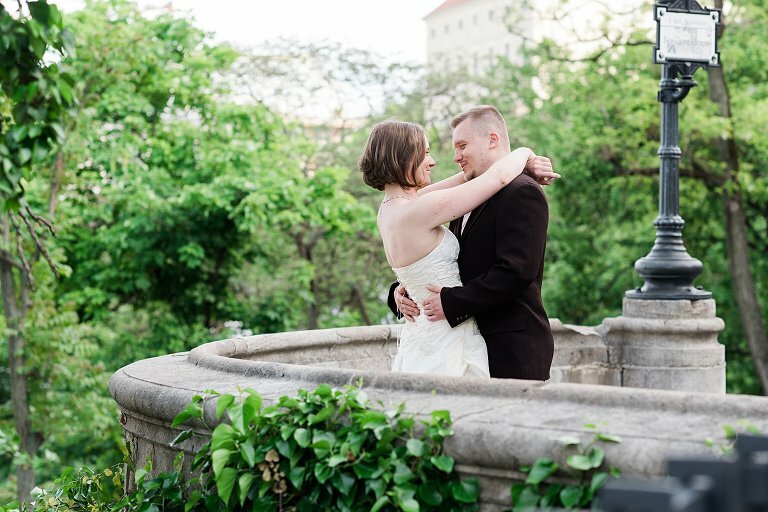 After discussing further details, we planned out their anniversary session to take place at several beautiful locations in Budapest. On the morning of their anniversary, Piroska told Miki about our planned photoshoot that would happen in a few short weeks. It was a great way to surprise him for their anniversary! A bit of a sidetone: a lot of times, people ask me why I am a photographer or why I like to photograph weddings. During my short time with Piroska and Miki, I was reminded over and over why I love what I do so much. It’s because for a small sliver of time, I become witness to the way people love and cherish one another. Typically, on a wedding day, there’s lots of nerves and stress, which I don’t mind one bit since I’m used to it, but the BEST part of every wedding is when I’m with the bride and groom alone, and they are settling into the reality that they DID IT! They GOT MARRIED! And they get to be with that person for the rest of their life. I always love that moment! When I was photographing Piroska and Miki, it was like they were reliving all of those emotions, but with the comfort and wisdom that comes with 10 years of really knowing one another, remembering all they’ve been through together, and what is yet to come. They just adored one another. It was probably one of the most special sessions I’ve ever been a part of! We held their session entirely at Fisherman’s Bastion on the Buda side of Budapest. It is such an amazingly gorgeous area with lots of little hidden gems! Yes, that’s her original wedding dress from 10 years ago! The way he looks at her? It was so sweet! This is one of my FAVORITE shots from the entire day. It wasn’t easy to get, but it was SO worth it! Love this one! There’s a song that goes “You feel like home, to me” and this photo captures that perfectly! This beautiful archway had the most stunning light! Happy 10th anniversary! Thanks for being so amazing and wonderful to photograph at such a gorgeous destination!